Good ol’ Brushwood Laurel. They’re probably the only band in the world to do bluegrass covers of Larry Norman (‘Look Into Jesus’) and Randy Matthews (‘Didn’t He’). With fast-pickin’ banjo and fancy fiddle, this co-ed college-age Milwaukee group of six lays down a fun good-spirited home-grown blending of bluegrass and Jesus folk. Most of their palette sticks to tried-and-true standards like the title track, ‘Somebody Stole His Body’, ‘I Saw The Light’, ‘Pickin’ To Beat The Devil’, and ‘Rocky Top’. Also a couple originals: ‘Goodbye Mr. Devil’ and ‘Another Man’s Shoes’. Slows down for a cover of ‘All My Trials’. Should find good company amongst Zion Mountain Folk and Fish House Fellowship Band. They had at least one other album, 1981’s South On 41. (The Archivist, 4th edition by Ken Scott). I’m amazed that you mentioned Fish House Fellowship Band. I saw them, along with about 10 other people at the Yellow Deli in Mansfield, Ohio once. I thought they were unique and fantastic! 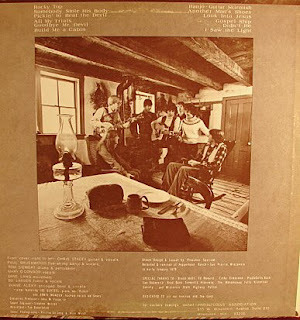 The Fish House Fellowship Band had two records, Country Melody in 1978 and Desert Plains in 1980. I don’t have either so you might check or request from John on Heavenly Groves blog. Brushwood Laurel were actually high school students when "Cabin" was produced. "South On 41," a reference to the Chicago studio Hedden West, was released when the band shrunk to 3 members. I have this album, and the production value is much better than BMAC. I’m looking for a original copy of the album “South on 41”. Can you tell me where I could find it and what it would cost? Chris Stacey guartist and Paul Mahn were HS and college friends of mine. Saw many of their shows. Great guys.